We are in the process of building a Geodesic Dome Greenhouse like the one above. I will document the build on this page plus I will publish any useful information I find on Geodesic Domes. 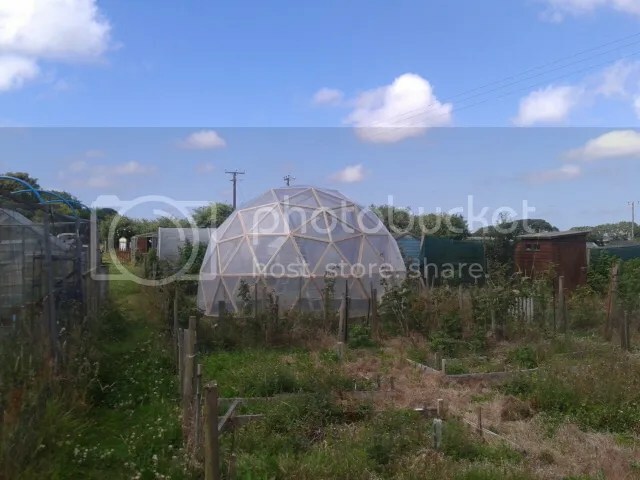 So why am I going to all the trouble of building a geodesic dome when I could just buy a greenhouse or a poly tunnel? Well, there are lots of reasons. One thing is I can build it in sections as and when I can afford it and I can buy all the materials including the poly tunnel plastic cover locally. If I was to buy a tunnel or a greenhouse I would have to buy it in one go. Our allotment is on a very windy site atop a hill and many tunnels and glass houses have been destroyed. The dome will be much more stable in the wind as it never presents a flat face to the wind. Geodesic domes are also very funky looking as and I am going to use this element to draw attention to all the other things we like to do on out plots like aquaponics and permaculture. People are going to want to visit the dome in a way that they wouldn’t bother with other garden building so there will be lots of opportunity to show people what we are up to. Geodesic domes tend to loose less heat at night because they have the minimum of surface area for the internal volume of air. This will be further improved because we will be insulating the north side of the dome. We also hope to later build a heat recovery system to store the heat from the day so it can be slowly released over night. The dome will eventually house an off grid aquaponics system so we can grow protein in the form of fish. I will start a new page on aquaponics nearer the time. Aquaponics uses the water from the fish tanks to water vegetables in specially designed grow beds. The vegetables benefit from the highly nutritious water but also filter the water for the fish. It is a closed loop system so only a small amount of water is lost through evaporation and transpiration so it is very water efficient. The dome we are building is going to be 4500mm in diameter and nearly 3000mm high. It will be built using 50mm x 25mm treated timber and covered with poly tunnel plastic. The dome is made up of 103 triangles. The triangles are covered in the plastic in groups of 3 and 2 so it is easy to get the cover drum tight and there will be no wrinkles. This is different from most other dome designs which normally have to be covered in one go once the structure is complete. I will be working from a set of plans designed by Paul Robinson at Geo-Dome.co.uk He has lots of designs in his portfolio with domes from 3000mm diameter to 11000mm. He even has designs for lean to domes and a dome tunnel. You are gong to need to buy or borrow a few essential tools in order to make a dome of this design. The two big investments are going to be a table saw and a mitre saw or chop saw. Expect to pay at least £100 for each of these but they will make the construction of the dome much quicker and a lot more accurate than trying to do it with hand tools and if you look after them they will last for many years and countless projects. You are going to need a Battery/Cordless Drill with a quick charger and at least a couple of batteries. there is nothing worse than having to stop work because you battery has run flat. Trying to hold everything together with your hands whilst driving screws into the frame is going to be next to impossible so you are going to need a number of clamps and we recommend 11″ Welders C Clamps. I would aim to get at least 6 of these. 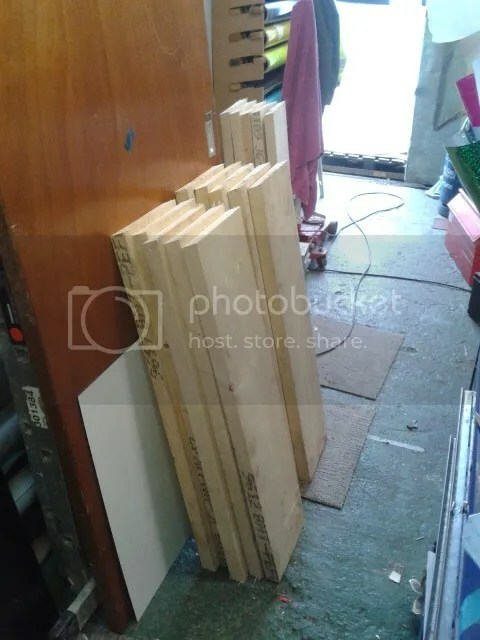 You will use them for making triangles, assembling triangles into hex and pent panels and then finally installing the panels to make the finished dome. I also found another type of welders clamp very useful for stretching the plastic over the frames. 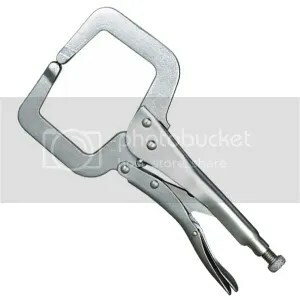 This type of clamp has flat plates that come together and really grip the plastic. It is much easier than trying to tension the plastic with your hands and you are less likely to injure yourself. To attach the plastic to the frames we use a staple gun. 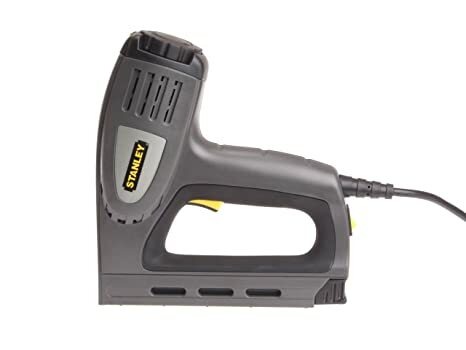 These are not too expensive a but I would recommend you get an electric stapler that uses 10mm staples like this one. You are also going to need a lot of staples. I think I ended up using about 6000 staples. 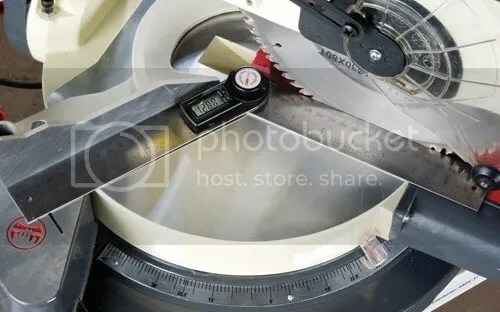 Other tools include things you might already have around the house like a stanley knife, panel saw, tenon saw, tape measure, carpenters pencil and caulking gun. We started off by building the base. I used brand new scaffold boards for this as they were about half of the price of other similar wood. Scaffold boards are very stable with few knots. First we removed the reinforcing metal bands from the ends of the boards and then cut each board into 4 equal lengths. There are 3 different types of base board to be built and there are 15 base boards in total. I stacked the boards in 3 groups of 5 and labelled the board A, B and C boards. A boards are slightly shorter but are level along the top. B and C boards have a slope from one end to the other B boards slope one way and C boards slope the other. This is because when we assemble the dome the bottom of the dome will not be perfectly flat but undulates and we can take up this undulation with the base boards. All the base boards have a 12° chamfer along the top edge and 12° angles on each end. It sounds complicated but if you just take each step at a time and mark all your boards the same way it is not too bad. Thanks so much! I bought his gd62 model for similar reasons but was actually having trouble with the figuring out the dome base! Scaffold boards us get smart. What is the width inside to outside of your scaffold base boards? You mention a 12° angle on the top as well as the end, does the lower portion of this slope inwards or outwards? On my design (GD15) the 12 deg angle slopes outwards and I think this would be true of most domes but I would double check your plans to make sure. Have you started building your dome yet? I am getting close to finishing all the triangles and will start covering in plastic next week so hopefully the dome will be completed in the next couple of weeks.